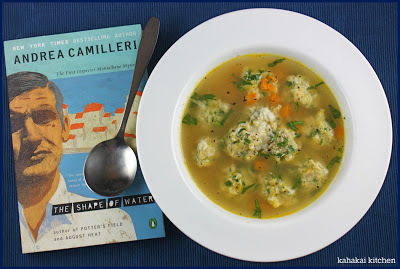 The Cook the Books Roundup for Andrea Camilleri's "The Shape of Water"
Our February/March 2013 Cook the Books book selection was Andrea Camilleri's"The Shape of Water", the first novel in his bestselling, long-standing mystery series featuring Sicilian Inspector Montalbano. We were joined by many regulars but we also had some new Cook the Books participants this time, so I would like to start off by welcoming our new bookish friends. Welcome! One of these new Cook the Books bloggers is Marla of Sightsbitsandbites. Her blog post about our featured book revealed her appreciation for the " laid back, almost conversational style" and the "quick-witted and funny" Inspector. 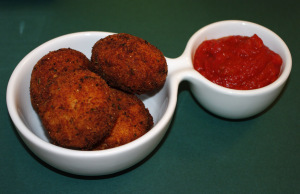 She made Arancini, a delicious rice ball stuffed with cheese, rolled in crumbs and fried. I'm sure Montalbano would have enjoyed finding this tucked into his refrigerator by his housekeeper, Adelina. 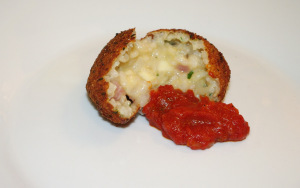 Marla's friend Louise, of Books, Cooks n Clubs (as in golf clubs), were a kitchen duo in their submission of the delicious arancini shown above. Louise really enjoyed the wittiness and playfulness of Camilleri's writing, from his phrases "“splendid specimen of a nincompoop” to “Magical shamanistic practices” (used to describe how people might have learned about things that only the head of crime labs was to know!). 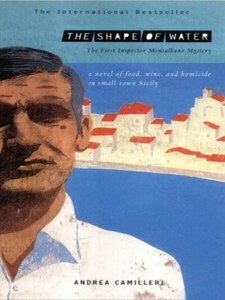 Cook the Books regular Claudia of Honey from Rock, enjoyed rereading this first Montalbano mystery, though she admits it is not her favorite in the series (not enough food references? too much sleaziness and corruption?). She was inspired to make up three tasty dishes for a Montalbano homage: La Vignarola (a springtime vegetable stew), polenta and boiled shrimp with lemon and olive oil. 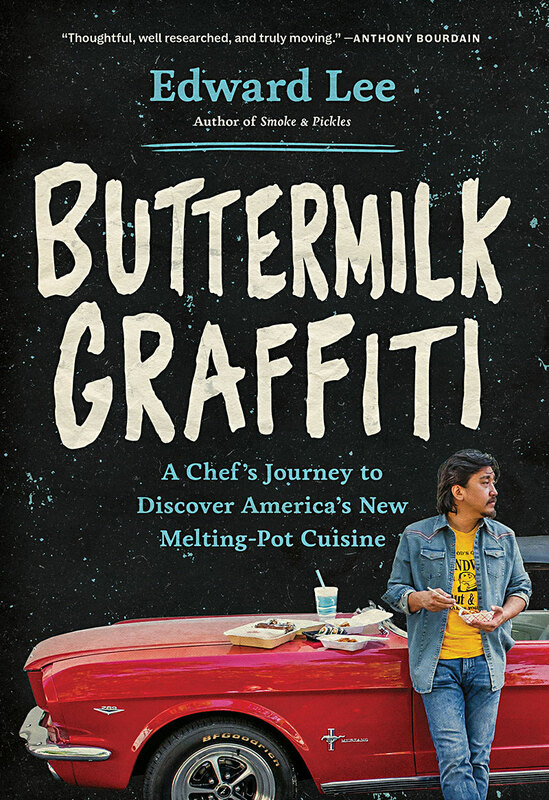 Hopping across the Hawai'ian islands from Claudia's home to Deb's Kahakai Kitchen, we have another take on the book. Deb took awhile to dig the book, but "By the end, I found myself quite fond of him and willing to follow him again on at least another adventure". Her culinary inspiration is a version of Sicilian Egg and Breadcrumb Soup with the charming name of "Sciuscieddu". 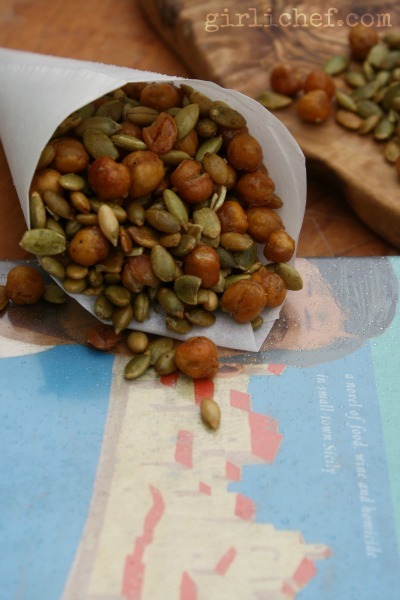 The paper cones of roasted chickpeas and pumpkin seeds that Montalbano snacks on in one scene in the book sent Heather the Girlichef to the kitchen. Her take on Calia e Simenza looks tasty indeed! 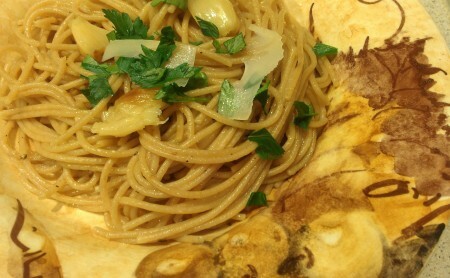 Ana, from the Mediterranean-flavored blog, Sweet Almond Tree, wrote an intriguing post about the book, food and opera. I really enjoyed reading her long and informative post. She also made a batch of Calia e Simenza and also whipped up a briny version of Pasta Puttanesca to celebrate our featured title. The Cat's Mother wrote a guest post on her daughter Foodycat's blog, not able to resist joining us in rereading and cooking from one of her favorite book series. Cat's Mother says "I dream of Sicily", and she not only cooked up an interesting and luscious looking dish, "Acquacotta Marememanna" (Cooked Water), but she procured and planted an Italian herb called calamint to make it. Kudos for going the extra mile for this little book club! The Cat's Daughter, aka Foodycat, and intrepid cook Alicia, took on the Shape of Water but was not as enamored of the book as her mum. She was, however, delighted to try out a couple of pasta dishes, a twist on the classic Pasta alla Norma and an exotic Pasta with Roasted Duck, Walnuts and Pomegranate. Awesome. It was on Simona of Briciole's advice that I decided to read and select The Shape of Water for our delicious little book group. She enjoyed rereading her favorite mystery series and I enjoyed reading this evocative snippet from her blog: "Sicily smells of sesame seeds. Not the actual island, but the Sicily of my memory. I close my eyes, I whisper "Sicilia" and I smell toasted sesame seeds. The same thing happens if I read about Sicily: I open one of my Montalbano books and my nose smiles." 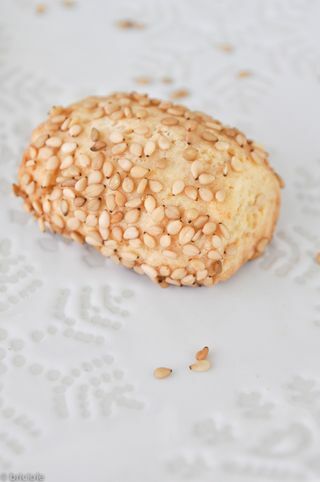 For her CTB post she decided to try her hand at making Reginelle, a kind of Sesame Seed Cookie". Eliot's Eats had a witty post chock full of fun quotes from the book and topped with a tasty serving of Whole Wheat Pasta with Garlic Two Ways. Finally, we have my own contribution from The Crispy Cook to this virtual literary feast. 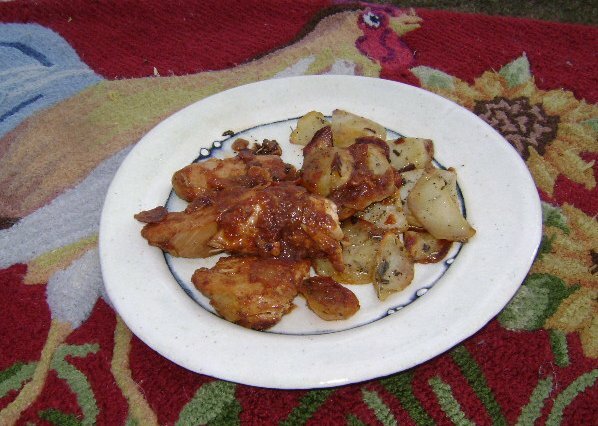 I shared one of my favorite Shape of Water witticisms " ("Ingrid apparently belonged to that category of woman who cannot resist the sight of a bathtub), and shared my adaptation of a Sicilian Pollo e Pomodoro, perfumed with apples and allspice. What a creative roundup. I always love reveling in the variety of reader opinions and the dishes we all cook up from our reading. I look forward to what our guest judges, Lavonne and David Neff of the Neff Review, will think of our posts. I'll be back soon with the Neff comments. In the meantime, please look forward to our next CTB book pick, The Color of Tea, by Hannah Tunnicliffe, which will be hosted by the lovely Deb of Kahakai Kitchen.